I hate to do this, but since I can’t drive it anymore due to an injury I’m selling my 2004 Porsche Boxster S. This car is in great shape mechanically and cosmetically. 2004 was the last of the first generation Boxsters. Its 3.2 liter flat 6 and 6-speed manual transmission are a joy to use. Aside from maintenance work, the only repair it has needed in the past year was a clutch and rear main seal. I intended to replace the IMS bearing at the same time. However, it turned out that the engine had been replaced under warranty with a Porsche factory rebuilt motor in 2008. This motor is a later version 3.2 which is reported to not have the problematic bearing. It also has more power than the original. 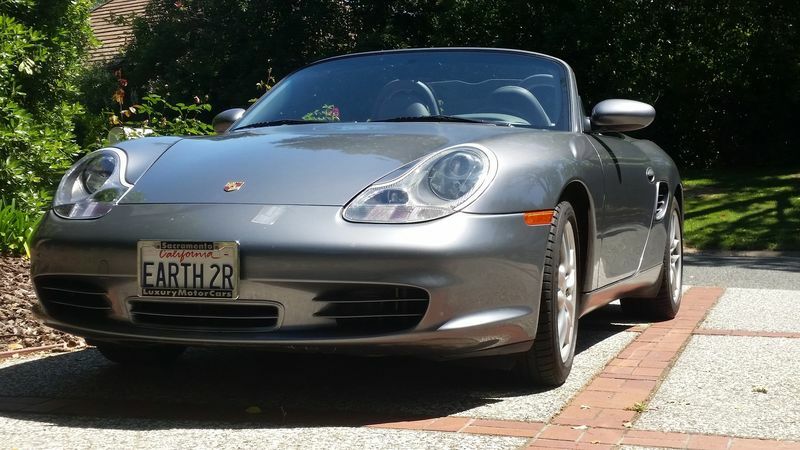 I am the third owner of this Porsche, originally sold by Stevens Creek Porsche in the Bay Area. The previous owner was an engineer like myself who maintained the car in pristine condition, always garaged or under a car cover when at work. This Boxster has never been abused or tracked. I have maintenance and repair records back to 2008. Clean CarFax available upon request. I’ll be glad to discuss more details by phone. I’m Dave at 650-281-46 eight eight. Last edited by imon_2nd; 05-05-2017 at 06:50 AM. That is a lot of car for the money. Too bad you can't enjoy it anymore. I've owned many sports cars and this Boxster S is by far the best of the lot; a great combination of power, handling and ride quality. The only category it falls short in is style. The Porsche is utilitarian as opposed to "designed" like some of the Italian cars I've had. Last edited by imon_2nd; 04-30-2017 at 06:08 PM. I know what you are saying about styling. The way I look at it is, the Germans follow the rule of 'Form Follows Function'. Style around the driver, engine and running gear. The Italians believe in form first and fit everything into the beautiful form. This is why, despite the Boxster being mid engined, it is really not bad to work on while many Italian exotics you can't even imagine working on. I agree with you about Italian design. As for the Boxster being easy to work on, I do not agree. Maybe it's just me, but I would need a proper car lift in my garage to access the underside of the Boxster. Jack stands don't get the car into a comfortable position for me. General note: I've lowered my asking price to $12,000. For the curious, the factory rebuilt engine serial number is M96/24AT67465245. I've corresponded with Porsche USA in an attempt to get more information about the motor, but they say it's confidential and won't cooperate. Dave, I'm coming this weekend to look! Agree on all accounts of boxster styling vs function. As I said on the phone earlier today, it looks like my Boxster sold for $11K on eBay to a guy from NYC. Of course, he may flake out, which seems to happen from time to time. If that occurs, I'll be sure to let you know. Thank you sir. What a bummer I was snoozing on the auction, I had not a clue. I'm not an ebay'er in general.